Sleep apnea is a sleep disorder that affects more than 12 million Americans. Sleep apnea occurs when the soft tissue in the back of the throat collapses and blocks the airway in the back of the throat. This causes the breathing to stop anywhere from a few to hundreds of times throughout the night. Breathing can even stop for more than a minute. Besides disrupting sleep, sleep apnea can cause cardiovascular diseases such as high blood pressure, memory loss, weight gain and headaches. Snoring is also a mild result of sleep apnea. There are treatments for sleep apnea. Dental devices are made to treat snoring and sleep apnea. 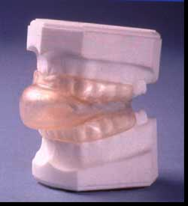 The first dental device is called a mandibular advancement device (MAD). 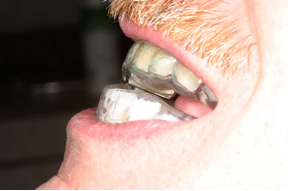 This device looks similar to an athletic mouth guard. It is created to move the jaw in a slightly downward and forward position. This widens the throat which increases the airway path which prevents the tissue from collapsing and closing. The second dental device is called a tongue retaining device or a splint. This is meant to hold the tongue back so that the airway remains open throughout the night. This device does not rely on the surrounding teeth to hold it into place. Instead it uses a light suction to keep the tongue towards the front of the mouth. Both of these devices need to be fitted by your dentist. Your dentist will advise you which device is best to deal with your problem with sleep apnea. Once treated make sure to keep in contact with your dentist, because occasionally these appliances can cause damage to your surrounding teeth, gums or jaw. Looking for a dentist who provides sleep apnea treatment solutions? Check out our sleep apnea dentists page to find one near you!